Passengers in an inflatable raft move away from an Airbus 320 US Airways. A US Airways jet landed in the Hudson River near Manhattan Thursday afternoon, plunging its 158 crew and passengers, including one infant, into freezing waters after apparently hitting a flock of geese. Miraculously, everyone aboard was able to escape, thanks to an incredible job by pilot Chesley "Sully" Sullenberger of Danville, Calif., who some witnesses said made a "three-point" landing on the water. "It would appear that the pilot did a masterful job of landing the plane in the river and making sure everyone got out," said Mayor Michael Bloomberg after the crash. "He was the last one up the aisle, and made sure no one was left behind him." Governor David Paterson added, "We've had a miracle on 34th Street, Now I believe we've had a miracle on the Hudson." The twin-engine plane was submerged in the icy waters up to the windows, and rescue crews had opened the door and were pulling passengers in yellow life vests from the cabin as the plane slowly sank. 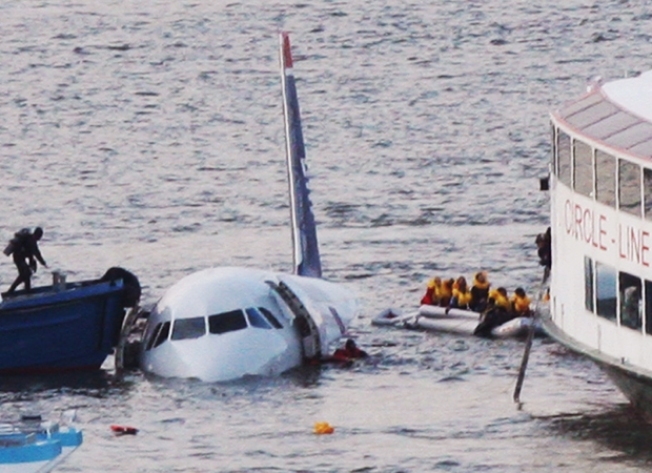 US Airways plane crashes into New York's Hudson River. An armada of boats –– including at least half a dozen commuter ferries –– as well as firefighters and federal officials rushed to the scene before the Airbus A320 could be lost to the murky depths. 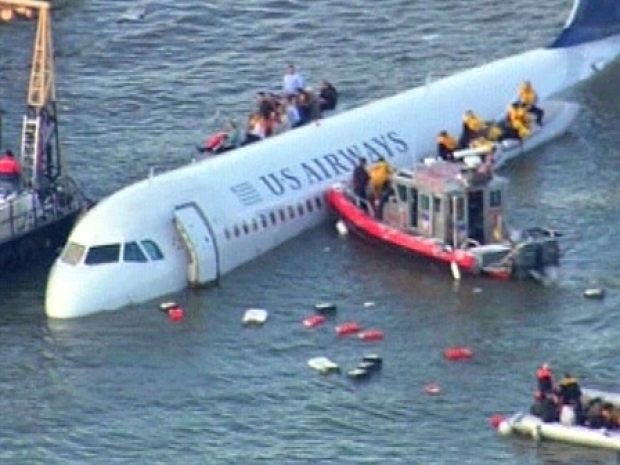 Authorities say 58 of the 155 passengers and crew were taken to New Jersey after being pulled from the sinking plane. The rest were taken to New York City. The frigid touch-down was the first non-fatal jetliner emergency water landing in 50 years of commercial flight, according to the Wall Street Journal. The plane crashed near the USS Intrepid aircraft carrier museum, near 43rd Street, on Manhattan's West side five minutes after it took off at 3:26 p.m. from LaGuardia Airport, the FAA said. It was later towed to a pier further downtown. "There were eyewitness reports the plane may have flown into a flock of birds," said Federal Aviation Administration spokeswoman Laura Brown. "Right now we don't have any indication this was anything other than an accident." An air traffic controllers union official said the pilot reported a "double bird strike" less than a minute after takeoff and was headed for an emergency landing in New Jersey when he ditched into the Hudson River. US Airways Flight 1549 was en route to Charlotte, N.C., and had 150 passengers and five crew members (two pilots and three flight attendants) aboard. Officials said there were only minor injuries. Passenger Jeff Kolodjay of Norwalk, Conn., said he heard an explosion two or three minutes into the flight. He looked out of the left side of the plane and could see one of the engines on fire. "The engine blew. There was fire everywhere and it smelled like gas," he said. "The captain said, 'Brace for impact because we're going down,'" Kolodjay said. He added, "It was intense. It was intense. You've got to give it to the pilot. He made a hell of a landing." “Prepare for impact" was all that was said by the pilot before the craft landed in the river, according to passenger Alberto Panero in a phone interview with CNN's Wolf Blitzer. "Somehow the plane stayed afloat and we were all able to get on the raft," said Panero. "Some people were on the wings and had to wait there but most of the people were able to get on the raft." "I don't even know how to put it into words right now," he said. "I actually grabbed one of the seats, that was the first thing that came to my mind. Some people grabbed the inflatable one. Immediately there were folks coming to us and throwing life jackets to us and helping us get to safety." "There were a couple of people who took charge and started yelling for everyone to calm down," Panero said. "Once everyone realized we were going to be okay, they settled down." The extraordinary rescue effort was due in large part to the ferries who quickly came to the plane's aid. "I saw it hit the river," a caller who witnessed the crash told WNBC Thursday. "It just came crashing down into the river. I was wondering why it came down so low; there's no airport around here." Scores of people in the city's highrises could barely believe their eyes as the the dramatic landing took place just outside their windows. "I'm on the 27th floor of my building, sitting on my couch," a witness told WNBC. "I got up and said, 'Oh my God, they're gonna land in the river.' I watched the whole thing." "I saw what appeared to be a tail fin of a plane sticking out of the water," said Erica Schietinger, whose office windows at Chelsea Piers look out over the Hudson. "All the boats have sort of circled the area. ... I can't tell what's what at this point." US Airways Chairman and CEO Doug Parker made a statement from company headquarters in Phoenix before rushing to New York. He said they would soon release the entire manifest of passengers, and anyone who was concerned that loved ones might have been on board should call 800-679-8215. Regarding the cause of the crash, Parker said "it's premature to speculate." Experts say that Canadian geese are one of a pilot's worst nightmares. A 4-pound bird exerts more than 6 tons of force if hit by a plane traveling 200 mph -- some geese weigh up to 15 pounds. A U.S. Air Force plane crashed during takeoff at Elmendorf Air Force Base in Alaska in 1995 after a collision with geese. Twenty-four people died. Birds caused another Air Force plane to crash during its approach to a runway in the Netherlands in 1996, killing 34 people. Joe Mazzone, a retired Delta Air Lines pilot, said it is not unusual for birds to strike planes. In fact, he said, when planes get ready to take off, if there are birds in the area, the tower will alert the crew. In the rare cases in which birds get sucked into an engine, "they literally just choke out the engine and it quits," Mazzone said. Twenty-seven years ago this week, an Air Florida plane bound for Tampa crashed into the Potomac River after hitting a bridge just after takeoff from Washington National Airport. The crash on Jan. 13, 1982, killed 78 people including four people in their cars on the bridge. Five people on the plane survived. On Dec. 20, a Continental Airlines plane veered off a runway and slid into a snowy field at the Denver airport, injuring 38 people. That was the first major crash of a commercial airliner in the United States since Aug. 27, 2006, when 49 people were killed after a Comair jetliner mistakenly took off from the wrong runway in Lexington, Ky. Send us your pictures of the plane crash.